PSA: St. Margaret’s has caught the basketball bug. 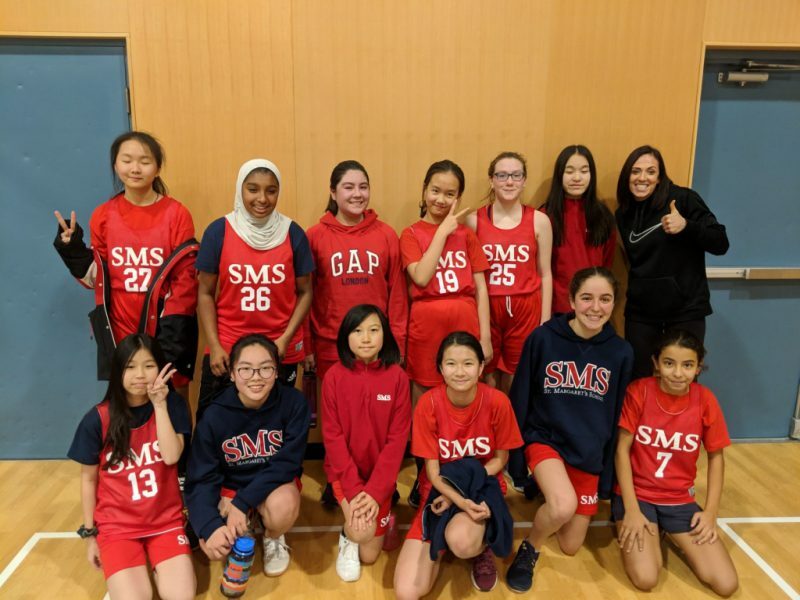 Over the past few weeks, the sound of squeaking shoes and basketballs dribbling has been a constant in the SMS gymnasiums. Whether at lunch time or after school, Monday through Sunday, there seems to be an athlete, ECE* to 12, with a ball in their hands. As a fellow gym-rat, I revel in this time of year where the middle school season runs into the high school season with night league overarching. Though we are a small school, we’ve boasted big participation numbers this year, adding teams in both the middle school and night league programs, there are roughly 75 students throughout the school playing basketball, that’s almost one in three! As one season closes, another one opens. Both the Junior and Senior teams will host their first home games on Wednesday, December 5th in the South Gym. All fans are welcome to come cheer them on! In other sporting news, the swim team for Grade 3-8 took its first plunge this Tuesday, November 27th in the UVic Pool as the team prepares for their first meet in early January. January will also mark the start of the middle school volleyball season. Stay tuned for more info in the New Year. Term one is often described as our busiest season for sports, but it is also the busiest season for all SMS Extracurriculars. St. Margaret’s offers a vibrant and varied club program for students across grades. In fact, there are so many great clubs, it will take two updates to get through every club. Art is one of the few whole school club opportunities. Each area of the school between FY, MY & SY, offers a configuration of Art Club. The FYs, (this term only offered to Grade 1’s), are led by Ms. Picco through a variety of student-centred art projects one lunch hour a week. The ENTIRE Grade 1 class participated in this fun club to create some amazing projects! We look forward to seeing what the next group creates in Term 2. The MY & SY clubs are creative in their approach by offering open studio time for the girls to work on their own projects or skill development, and to hang out in a fun, creative space. Artists, Ms. Huneck & Ms. Kao, are crucial to making this a favourite club amongst students! The FIRST Tech Challenge team has started off with a bang! This is group of nine Gr. 7-11 students who are interested in STEM. In addition to our two coaches, the team is supported by our awesome IT specialist, Michael Latreille, and past SMS Computer Science teacher, David Barlow. As a club, they attended two events with other FTC teams on Saturday, Oct. 13 and Saturday, Nov. 17. They have been working hard on building their sense of team and communicating effectively. Team members have worked hard on creating their engineering notebook, learning Java programming language, and building a robot out of metal bits and electrical pieces. The Green Team (K-12) has been hard at work this year to affect positive change, greater awareness and better understanding of Green initiatives at St. Margaret’s School. Each week, the clubs, K-6 and 7-12 respectively, meet to head up the recycling program. In Term one, the Grade K-6 Green Team, continued to build off their efforts last year in the Jr School. Once again, they are collecting batteries to recycle, managing the compost program, and helping to keep our Jr. School as eco-friendly as possible. Meanwhile, the Grade 7-12 Green Team has developed a new initiative to engage homeroom classes in the recycling and compost programs in the Sr. buildings. There hopes that this new program will create better awareness for recycling and composting, and better adherence. They also hope group-sourcing this program will allow the club to focus on other green initiatives at the school. We can’t wait to see what the team will do next! Feeling festive and green? Check out the Green Team’s Christmas tree in the Bay Centre over the holiday season and VOTE for it. Attention: Mathletes here! Once a week, Mrs. Hanosh meets with interested Grade 7 & 8 students to work through math skills and problem solving strategies needed to be able to solve higher level math problems. They also work on more efficient methods of solving math problems as they will be timed in answering the questions as they prepare for the Math Challengers Contest! In Term one, 41 of St. Margaret’s Model UN members travelled to Shawnigan Lake School for the Model UN Global Goals Conference. In this taster, the students researched, debated and designed solutions to issues like climate action, gender equality and quality education, representing countries around the world. Ines Khouider, representing the Delegation of China, received the Best Delegate for the Global Goal of Affordable and Clean Energy, and Sakura Hu, representing the Delegation of the United Kingdom, received Honourable Mention for the Global Goal of Decent Work and Economic Growth. Congratulations to the entire MUN team for their incredible representation of St. Margaret’s School. We can’t wait to see how this dedicated team does at their next conference! Outreach has been busy in Term one. This year, Outreach continues their work with Me to We as a WE School. The club has been hard at work between weekly Executive meetings and full club meetings to explore real-world challenges and opportunities to take action. Through annual campaigns like “We Scare Hunger”, the club looks to give back to our local community by donating all goods to the Mustard Seed. 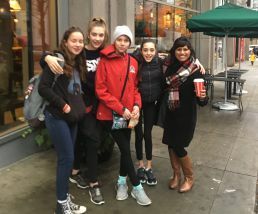 Another highlight this term was the club’s recent trip to Vancouver to attend WE Day 2018! This fantastic day offers an opportunity for change-makers all across BC to come together to celebrate their amazing efforts and connect with other inspirational young people as they work to make the world a better place. Coming up next term will be one of the club’s biggest annual initiatives: the Outreach Benefit Concert.